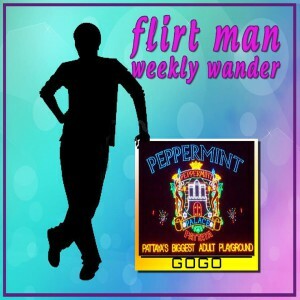 FlirtMan’s Weekly Wander heads to the none-too-visited ex-falang area known as “WalkingStreet”. What was once a haven for European visitors and expats alike has slowly morphed into a spectacle for Russian,Indian and Asian tour groups exclusively. The chosen venue this week was an old favourite named Peppermint Agogo and proclaims itself as Pattaya’s best adult entertainment playground. Some background on this joint may be called for as a few years back they left their original location (upstairs beside marine Disco) to a ground level street unit, which would assume more customers wandering in as now no escalator to negotiate. The new peppermint was exactly the same layout and fittings as the old venue so much so that after a few beers you would question why they moved (even more beers later…… if they had moved ). It had been a while since my last visit so i was expecting much the same tried and tested formula of ye olde days of yore…but a surprise was in store. The huge rear dancing stage , which accommodated up to 12 maidens has now been demolished and replaced with a more modest affair of a small square podium. Now you get a maximum 6 ladies strutting their stuff on this section as well as another rectangular dance floor near the entrance. Gone is the “bargain basement” jail section at the toilet door along with the “birthday suit” stage facing the DJ box. Looking around the bar there did seem to be the same amount of ladies as ever but just less dancing space. This probably leans the idea that more girls can chat and massage the customers rather than tie themselves up on the chrome poles. It’s the group behind “Happy” agogo and Beach Club etc so they definitely have access to a huge number of dancers and many in Peppermint are in the stunning category. They still retain their 69baht draft beer although the glass is really pushing to the small end of the spectrum so it’s not the big value that it looks as well as sending out the “cheap charlie” signals to the ladies. My guess is that you’d be hard pushed to get approached in any form whilst nursing a frugal draft beer . One nice touch retained by peppermint is the superb DJ offerings. The music always was on point in the past and it’s the type of place where you can go in to just chill and listen to some good dance tunes. The pre-shazam days seen FlirtMan wandering up to the DJ box many times asking what the name of so & so tune was. Without dwelling too much on the past it would be fit to say that Peppermint is still a safe bet when it comes to a good Walking St gogo bar. Yes the beer is small. Yes there may be too many asian customers (and moved out with their old little corner)…and yes there may be a smaller dance floor but it’s still proves to be one of the most popular gogo bars in this fair town of ours. The staff are efficient and the Happy group are like a well-oiled machine in the gogo game.